Public Work Department PWD (Sarvjanaik Bandhkam Vibhag Maharashtra) inviting applications for 405 Junior Engineer (Civil) posts. 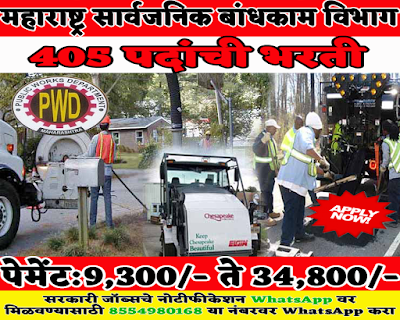 Interested and Eligible candidates who wants to apply for these posts submit their applications on official website of Public Work Department PWD (Sarvjanaik Bandhkam Vibhag Maharashtra) before 25 January 2019. For more details like age limit, salary, how to apply, selection process please refer the below article. Rs. 9,300/- to 34,800/- (Gred Pay Rs. 4,300/-) payable as a salary. Best performing candidates can be selected. Check official notification for selection process information.